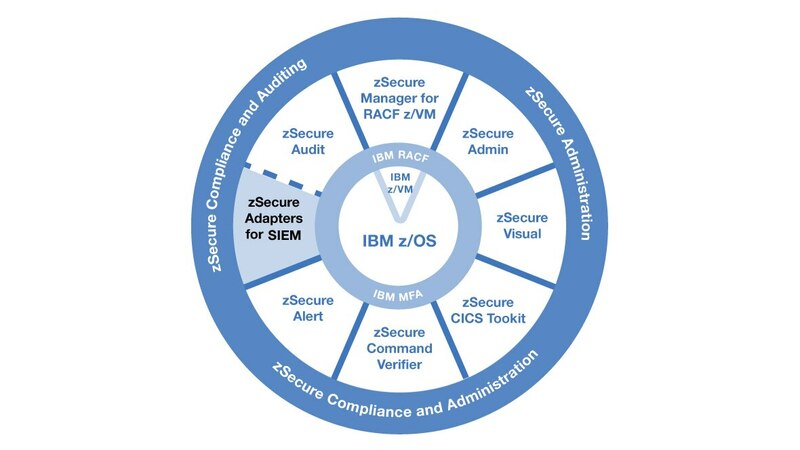 IBM® Security zSecure™ Adapters for SIEM formats and sends near real time enriched mainframe System Management Facility (SMF) audit records to SIEM solutions such as IBM QRadar SIEM. SMF audit records are then included in enterprise-wide integrated security information and event management (SIEM), log management, anomaly detection, incident forensics, configuration checking and vulnerability and risk management. Extend protection against advanced threats and integrate mainframe security with optimal security intelligence by implementing zSecure Adapters for SIEM. Help lower the cost of event collection for over 40 different IBM System z® SMF record types, and efficiently handle large numbers of events. Add enriched descriptive audit information about the user and the resource using intelligent filtering, identifying the name, privileges, and other security information. Replaces manual security event analysis with automated near real time detection of security exposures, providing exceptionally accurate and actionable insight.